This product has been replaced by part EZ50B which has better performance and stability. 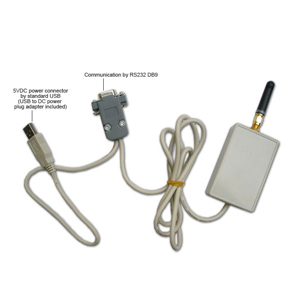 If you need to communicate over more than 300 feet which is the maximum distance for Class 2 Bluetooth and don't have Wi-Fi available then these serial wireless RS232 RF radios offers easy and convenient wireless bi-directional RS232 serial networking capabilities broadcasting in the unlicensed 433.30MHz band. Great for serial RS232 wireless communication with printers, building control, scales, alarm and security devices, CNC's and manufacturing machinery and most other general and industrial serial devices. Each radio works as a transceiver which means it can both transmit and receive data, however not at the same time (half-duplex only). It can be configured for point-to-point and point-to-multipoint communication which makes upgrading or expanding your existing network easy. See our serial wireless RF setup examples for details. 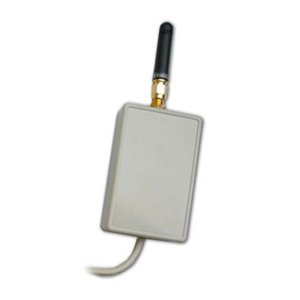 Each package contains one serial wireless RS232 RF radio. You will need two radios to setup a communication link. The radios can be powered by the included USB cable or an external standard wall plug 110VAC/5VDC adapter (not included). The parameters of these radios must be configured through the RS232 interface. If your computer does not have a serial COM port, we highly recommend using a reliable quality USB to RS232 serial converter such as our Pro USB to RS232 adapter which is fully compatible with these radios. Establishing a wireless RS232 link using two RF radios is probably the easiest way of making a wireless RS232 link. If you use the default settings of the wireless RS232 radio you can simply connect one unit to your computer using a USB to serial cable and the other wireless RS232 radio to your serial device, connect the power supplies and the link is ready to use. No pairing or other configurations are required. Most wireless RS232 radios communicate in the unlicensed radio frequency band (RF) at 900Mhz, 433Mhz or 2.3Ghz band. These bands can be used without a license so you do not have to worry about obtaining a license to use these radios. The wireless RS232 radios we sell can be configured for most typical serial settings. The included configuration software allows you to configure the baud rate, data bits and other port settings. Most of our RS232 radios have up to 12 channels, which means that you can use up to 6 pairs of RS232 radios at the same location without they interfere with each other. Each wireless RS232 pair is simply assigned a different frequency in the 433Mhz band with the included configuration software. All our wireless RS232 radios are designed with the high performance SP232 serial driver and a CC1101 RF chipset, which makes these radios very reliable and compatible with most applications. 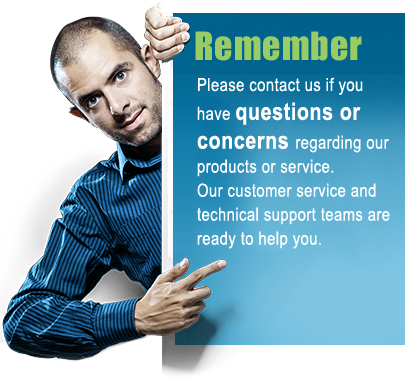 Each wireless RS232 radio is shielded internally to protect surrounding equipment against interference and also to protect the radios against electro-magnetic noise and radio frequencies from external interference.